___What is EMR/EHR and what is its effect? ___EMR (Electronic Medical Records) or EHR (Electronic Health Records) is the newest name for what is also called HIS (Healthcare Information Systems.) The purpose of EMR is to create efficiency by making all medical documents electronic, searchable, and located in a central database. EMR software is complex and expensive and over the past few years has started to be adopted by large hospitals and medical groups. The United States government is giving doctors incentives of up to $44,000 per doctor, per practice to upgrade to EMR compatibility. It was also planned that by 2015 the US government would switch from the current incentives to charging tax penalties for practices not integrating with EMR. The term used to describe whether the upgrade counts towards this incentive was "meaningful use." The formula used to determine meaningful use is based upon the number of Medicare / Medicaid patients seen, and the technology used. Though doctors in private practices will generally not implement an EMR they often will transmit patient data to larger hospitals, or medical groups that do have an EMR and can thus qualify for a portion of the US government's incentives for meaningful use. A Good PACS will smoothly transfer images and data from your ultrasound's study (if it has DICOM SR) to an EMR, qualifying as meaningful use. From the perspective of an ultrasound system, the minimum requirement to transfer images to a PACS and then into an EMR is to have an ultrasound machine with DICOM. 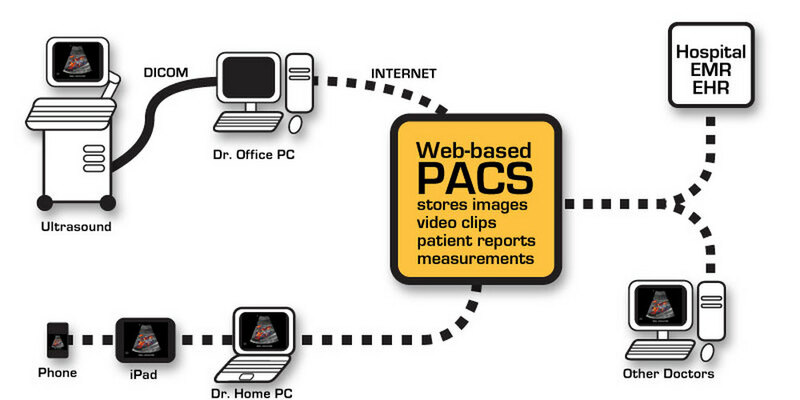 If the ultrasound machine also has DICOM SR (Structured Reporting) then you can transfer both images and connected measurements and data through your PACS into an EMR. All VUE ultrasound machines have DICOM standard or as an option, and are therefore EMR ready. _VUE sells a Web-based PACS that is affordable, tested with our systems, and takes only 10 to 30 minutes to install on one of your office computers. No server is necessary, and your images can be transferred to your Hospital EMR, other doctors, or viewed from any internet connected device such as a smart phone, iPad, or your home computer. Interested? Contact your VUE rep for more information.